M代官山のブログ／M IS (Y)OUR BAR. 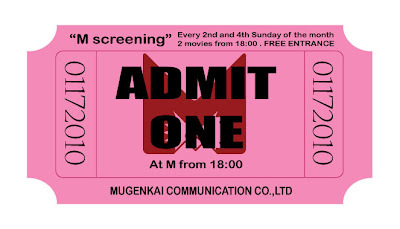 M IS (Y)OUR SPACE by M Daikanyama: M SCREENING !! THAT WHY WE WILL PROPOSE YOU 2 MOVIES EVERY 2nd & 4th SUNDAY OF THE MONTH FROM 18:00 FOR FREE !! USING OUR PROJECTOR OUR SOUND SYSTEM. PLEASE SEND US ANY REQUESTS !!! CHECK THE SCHEDULE ON OUR WEBSITE ! !